Walking onto the S.S. Antoinette, you will immediately feel like you stepped into France's Château de Versailles during the late 18th century with the character of the past thoughtfully blended with unusual elements creating luxurious elegance with welcoming warmth. A blue Strauss 10-foot Baccarat chandelier with huge sapphires, originally hung in New York's famed Tavern on the Green, graces the two-story lobby. The finest Brazilian marble adorns the walls and floors and a sparkling 19th-century Venetian glass mirror rests high above the reception desk reflecting an air of grandeur. 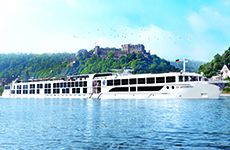 It is clear as one continues to gaze around the remarkable surroundings, the S.S. Antoinette shares the same exquisite standards and meticulous attention to detail reflective throughout all of Uniworld's fleet.